Items developed and sold in our gallery and on our website can be shipped FedEx, USPS, or UPS. Our daily contracted arrangement with UPS offers the following options: Ground, 3rd Day, 2nd Day, or Overnight. When your order is completed, the UPS tracking number will be sent to the e-mail address you provided when you placed your order. Often times a picture or framed project is too large or heavy for our customers to transport to and from their home or office. 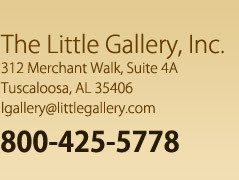 The Little Gallery offers a free Pick Up & Delivery service for our local customers.